We begin the week with the Wall HoH comp complete with Jury members all fighting to get back into the game. No one wants this to happen, but they have no choice; well, Natalie and Michelle would love to have Bridgette back in the game, but otherwise, no one wants anyone from the Jury back in the house. Then we find out that four hours before the eviction, Paul, in his own words, “totally blew up [his]game” by starting a conversation with James in the kitchen about them having each other’s backs during which, Michelle pipes in to tell him that oh yeah, Paul totally had James’ back, Paul, the biggest lair and manipulator in the house, he’s the biggest baby in the house… Oh, Meech… So, Paul hates being interrupted even more than I hate being interrupted, especially when he’s not even talking to the person who interrupted him, from what I see, because he immediately comes back at Michelle. She can’t talk to him that way, he’s never done anything to her to warrant this attack from her and blah blah blah – he calls her the C-word, and I think we all know what word I’m talking about. He calls her a bully, says she talks down to people, she’s a terrible person, she likes to kick people when they are down; finally, Michelle has had enough and she goes to the Safari room. Paul continues his conversation with James saying that he didn’t have a problem with James until he was on the block. This begins a whole back and forth between James, Paul, and Natalie who says that James had nothing to do with her noms, it was all her and they do not make decisions together because she was really mad that he put Bridgette on the block. Then James adds to the conversation, to further reiterate how much he and Natalie are playing their own games, that Natalie really wants Victor to stay this week. Nicole, in the Bathroom listening, is shocked to hear this, as is Corey who has been present in the kitchen for all of this. Natalie isn’t afraid to own up to it either. Yeah, she wants Victor to stay, she’s been trying to convince James to vote that way, but James doesn’t know what he’s gonna do. Well. Nicole is not happy about this at all and in the DR she doesn’t understand Natalie’s crazy strategy of wanting Victor to stay when she’s supposed to be in an alliance with her and Corey. In Tokyo alone with Corey, Nicole asks if Natalie for real said she wants Victor to stay, he confirms that she did and now Nicole is worried, BUT she doesn’t need to be because as we know, James did not keep Victor, he voted him out of the game. And we’re back to the HoH comp. 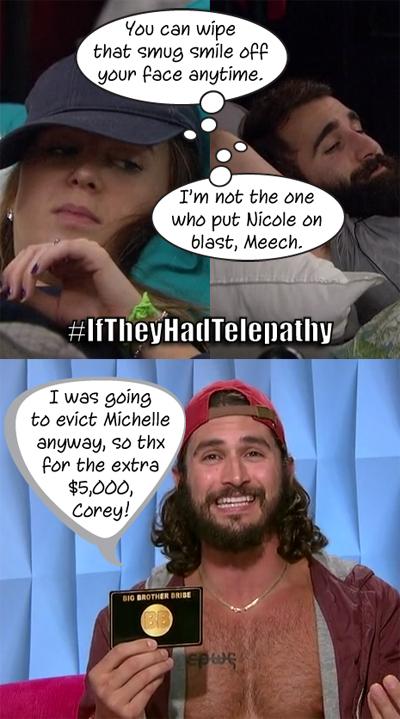 Nicole really wants to win to make sure she and Corey are safe because she doesn’t really trust James or Natalie since they were thinking of evicting Corey last week. Da’Vonne really wants to win too, buuut… She’s doesn’t like heights or water and this comp involves both and we don’t see how long she was up there, but it’s not that long. Both she and Zakiyah jump off of their platforms at the same time. After 25 minutes, Corey can’t hold up his weight anymore with the Wall tilted the way it is and he jumps. After 33 minutes, Bridgette can hang anymore and she’s out of it. So it’s down to Paulie and Victor and despite an amazing recovery, Paulie the Wall defeats Paulie after 48 minutes and Victor is back in the game, AGAIN! But he’s not winning HoH this time. Victor drops from the wall after 50 minutes. So it’s down to Paul, Nicole, and James and they all want this HoH BAAAD. After an hour and 35 minutes, though, Paul slips leaving Nicole and James to battle it out and let me tell you folks… I watched this comp on the live feeds and I was yelling at James the whole time to stay up there, to not listen to Nicole whining about wanting a letter from her mom because she hasn’t gotten to hear from her family at all, but um… You won the first HoH, Nicole! Sure, it’s been awhile, but you did get a letter from home. Anyway, James really wants to win this Wall comp because he’s a beast at the Wall comp, buuut after and two hours and four minutes, he gives in to Nicole and lets her have this HoH. Before the comp, Michelle expresses her concern to Nat and James about Paul choosing Corey; she’s pretty sure she’s the target this week. She just knows something is up with those four – Nicole, Corey, Paul, and Victor – She just knows it. What if they are going to pick the three of them off one-by-one? Great job for figuring this out, Meech! James says if that’s the case, he’d be the first one gone. Natalie tells him to win that Veto. Upstairs, PVCN, which is MY alliance name for Paul, Victor, Corey, and Nicole, are pretty happy with the Veto pick. They are worried that Paul’s pick will rise suspicions in NJM, but they had that falling out so it makes sense to them for Paul to pick Corey. They all feel pretty good about things as long as Michelle or James don’t win the Veto and it’s the Counting Comp! And it’s all Christmas-themed so you know Corey is loving this. There are actual REINDEER… Or animals that look like reindeer because my mom says they are not actual reindeer, but who cares – they look the part enough to draw Corey’s attention away from the Veto and towards all the Christmas stuff around him. So we all know how this comp so here we go… Round One, 77 Nutcrackers, both James and Nicole earn a candy cane since they were both only one number away from the Nutcracker count. Victor is furthest away from the correct answer of those that didn’t fold sooo there goes that plan! Round Two: 513 Carrots. James is eliminated and Nicole gets another candy cane. Paul would have gotten a point if he had stayed, but he’s folding until Michelle is gone. Round Three: 1879 Nice List Names. Corey guesses 1,000,000,000 and stays so Nicole will definitely survive the round and hopefully win her last candy cane, but she doesn’t win the point because Michelle was closer to the actual number so it was actually a brilliant move by Corey since Nicole would have been eliminated. Paul would have gotten the candy cane if he had stayed though… Round Four: 139 Teddy Bears. Nicole wins the point and the Veto! After a fun segment with Paul and Vic in the Safari room during which they talk about how much they miss female company, they pretend to make dating videos, they talk about themselves and blah blah blah… Michelle is in bed in the UK room all frustrated about being nagged to “not obstruct her microphone”. She’s just sooo over the microphone, the house, the game. Natalie enters and tells her to hang in there, Michelle doesn’t soak it in, she’s not in a good mood at all and she’s ranting. She thinks she’s ugly, she hates Victor, and lol. I’m sorry, Meech, I know the house is a pressure cooker, but this segment is hilarious. 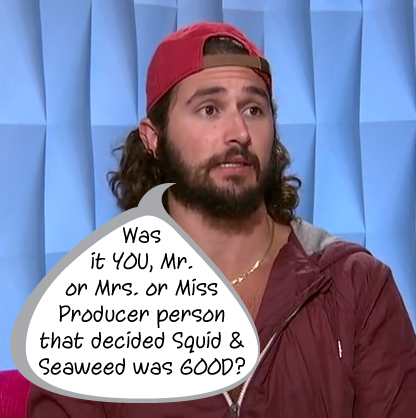 We all have those moments, Meech… We all have those moments… Upstairs, Paul joins Nicole in the HoH room to let her know that he trusts her, like, a billion percent, he’s only been acting all unhappy and stuff to keep up appearances around James and Nat. Paul has an idea, though, a way to think ahead and use her Veto strategically with next week in mind. He thinks they should really rile up Nat, James, and Michelle by having Nicole take Paul off the block, put Natalie up, but still send Michelle to Jury. It’s a way to get Natalie and James all rattled for next week. Nicole does not see things the way Paul does. She thinks he’s just trying to get off the block because he doesn’t really trust her. She knows she has to make the right choice with this Veto because it could cost her half a million dollars. She chooses not to use the power and either Paul or Michelle will join the Jury this week. In the next segment, the HGs get messages from home and it’s super emotional for Paul and Victor; everyone loves hearing from their families and it’s great. Then we get a closer look at Victor’s family and friends and learn about their struggles after Hurricane Katrina and, like, I totally want to go to Louisiana to hang out with Victor’s people because they look like a totally fun group. After all that, it’s time to vote, but first, Paul makes his plea for everyone to be Friendship and keep him in the house. Michelle, well, she’s obviously nervous and her “please vote for me to stay” speech is not nearly as entertaining as her exit speech because duh – the vote comes down to a tie and duh – Nicole votes to evict Michelle and omg… She reminds the house again that Nicole is the one to target, but in speech says that she is coming after Victor if she stays because he’s a beast, then, as she literally walking out the door… Michelle says that Dan Gheesling is her cousin-in-law. WHAT??? No, it’s not. And Michelle’s interview with Julie is great so I highly recommend watching the episode if you missed it, MOM, you can watch it at CBS.com very easily since you have ALL ACCESS… There will still be commercials because I’m not paying more money for us to NOT have commercials. 😉 Love you, Mom! So Michelle is joining the Jury and omg, Paulie must be losing his mind in the Jury house right now. And the HoH comp is the Egg comp so this is where we end things this week. Previous ArticleHow To Watch Our #BBOTT Live Shows! Next Article #BB18 Week 11 Recap Show With Bronte D’Acquisto!